I love a lot of products from the Sei Bella brand (look back to about a week ago when I reviewed their eye shadow - which I loved). But this lipstick just misses the mark. The packaging is lovely. It's a more oval shape, as opposed to round, which actually make it's more convenient in your bag or pocket. The container has a metal feeling to it as opposed to a cheap plastic and it looks very sleek. The scent is also really nice. It has a light cocoa smell, which is pleasant and not overwhelming. That's where the good stops unfortunately. When it comes to variety there are only 18 shades, and the matte shades aren't a true matte, they just aren't shimmery. There isn't much to say about the pigmentation of this lipstick. It's drugstore quality. Three layers will do fine, but it's nothing to talk about. It comes off within a few hours of wear and it transfers A LOT. Like I mean a ton. 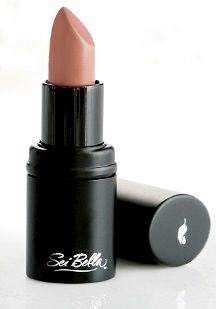 Even two hours after application you could kiss off 100% of this lipstick within 5 smooches. For the high end price point, it's simply not worth it. How do I remove my Fashion Color?